Communication sophomore Kimani Isaac speaks at a community dialogue on Monday. Isaac presented her petition calling on the University to lower the amount spent on textbooks. 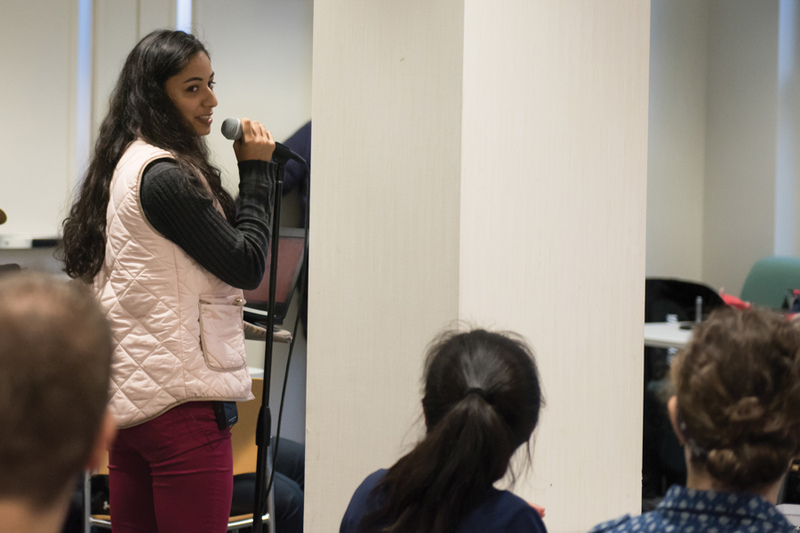 Students called on Northwestern to lower textbook costs and increase accessibility during a community dialogue in Allison Hall on Monday. The request comes after a petition, created Thursday, that asks the University to lower the average amount of money spent on textbooks. It also follows a new pilot program that loans eligible first-year students textbooks for science, technology, engineering and mathematics classes. Out of roughly 350 eligible students, about 150 have taken advantage of the program, associate provost for University enrollment Michael Mills said. Communication sophomore Kimani Isaac presented her petition — which has garnered more than 850 signatures — to students, faculty and administrators at the dialogue. Isaac said her personal experiences prompted her to spearhead the campaign. Isaac outlined the petition’s seven requests, including ending the use of course packets –– which she said are both financially and environmentally inefficient –– and buying licenses for popular online resources like Sapling, Pearson and McGraw Hill. The petition also calls for the elimination of the summer-work contribution from financial aid packages and requests the University provide financial aid recipients with grants to cover textbook costs. University director of financial aid Phil Asbury said those costs are about $1,660 per student each year. Mills said he had not yet seen the petition but looked forward to reading it. He added that the University is working hard to meet students’ growing need for financial support but acknowledged its room for improvement. Isaac said she agrees the University is making an effort to improve financial aid. The issue of expensive textbooks and poor financial aid exists throughout the country, and it is the University’s responsibility to increase accessibility, she told The Daily. Daniella Lumpkin, Associated Student Government’s speaker of the Senate, said she appreciated administrators’ willingness to discuss financial issues but also expressed her frustration with a lack of progress.